I always feel like a need a new coat every year. Something fresh, new and really warm. But when this happens, I often get too caught up with how it looks and less on how warm it's actually going to make me. Luckily for me - this year I'm really loving the look of some of these thick and warm looking puffers and parkas. Puffers particularly. 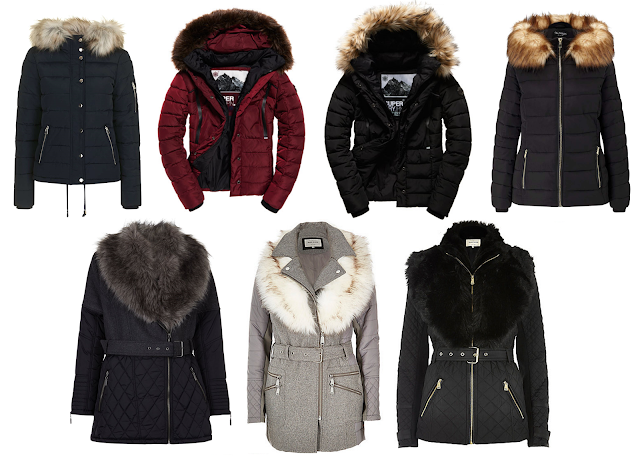 If I had to have ANY of the coats up here, I would be so on that gorgeous black fur one from Superdry (3). On the model it looks so warm and I love a fur hood. I've never had a puffer jacket either so I think it would nice to finally own one. I think it would be versatile, timeless and I also think it's one of those investment pieces when you spend a little extra on a coat. Right now, I just feel my coats aren't very versatile because of colour or are simply uninspiring. I've got two good coats, but they're smart and I need something that's a little more casual and better for work, walks and general icy days! An everyday coat as such. What sort of coats are you looking at for this Autumn/Winter? I too really love the look of the grey furry one, perfect for the colder weather!